SOCIB Modelling and Forecasting Facility published an article comparing the impact on the forecast performance of the WMOP model of the assimilation of observations from a fleet of gliders and from a dense CTD survey. The rich set of observations collected during the REP14-MED sea trial carried out off the west coast of Sardinia in June 2014 was used for this study. The REP14-MED sea trial (Onken et al. 2018) was led by the Centre for Maritime Research and Experimentation (CMRE, NATO Science and Technology Organization) and supported by 20 international partners, including SOCIB. 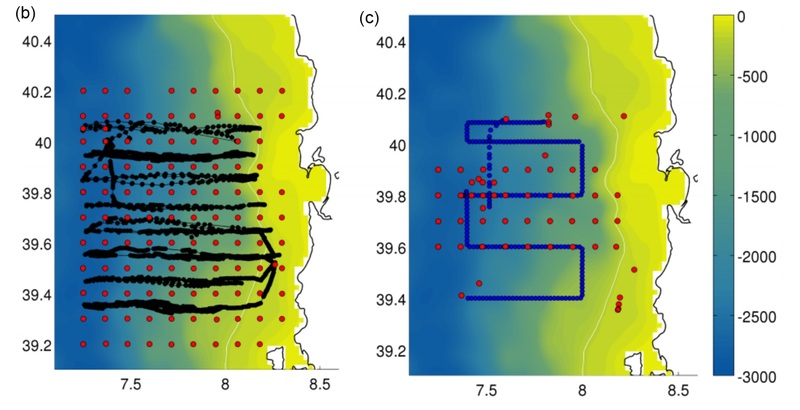 As a main outcome of this study, a fleet of eight gliders is found to provide similar performance to the 10 km spaced CTD initialization survey, with an overall 40 % model error reduction capacity with respect to the simulation without data assimilation. Figure: CTDs from Leg 1 (red) and gliders (black) observations used for assimilation are shown in panel (b). Independent CTDs (red) and ScanFish (blue) gathered during Leg 3 and used for the validation are shown in panel (c). The color bar indicates depth (m) and the white contour indicates the 200 m isobath.